Today we met a deaf congregation in Harbin where I gave a short testimony. Then we went on a hour long car ride to Heilongjiang Provincial Protestant Bible School. If you were deaf and wanted to become a pastor in China, this was the seminary you’d attend. It’s the only seminary in China that accepts and trains deaf students to become pastors in the deaf community. Heilongjiang Provincial Protestant Bible School is a large campus with at least 5 buildings that included a dormitory, restaurant, library, and classrooms! We went to the building with the restaurant for lunch. Before we were seated, I noticed a tray full of some strange yellowish-brownish drink that looked like pee. There was an explanation of the drink on the label in Chinese. It tells us that the drink is Russian, and is made from fermented rye bread. The drink is called gewasi (格瓦斯) in China, but it is better known as kvass (квас) in Russia and elsewhere. Here’s a closer look at the bottle. Can you spot the Russian name of the drink on the label? In 1900 a Russian merchant named Ivan Churin founded Harbin Churin Food to cater to the popularity of Russian foods in China’s far-northeastern Heilongjiang province. In addition to foods like lieba (a type of Russian bread) and lidaosi (Lithuanian sausage), Churin sold kvass, a lightly alcoholic beerlike beverage made by fermenting rye bread that had been popular for centuries in Russia and eastern Europe. With alcohol content well under 1.2% — and generally closer to 0.5% — kvass is generally considered a soft drink with healthful properties, partly due to its vitamin B content and partly because it doesn’t have nearly as much sugar as most sodas. Kvass caught on quickly in Heilongjiang. By 2009 Harbin Churin Food was producing 5,000 tons of kvass a year for a 90% share of the local market. 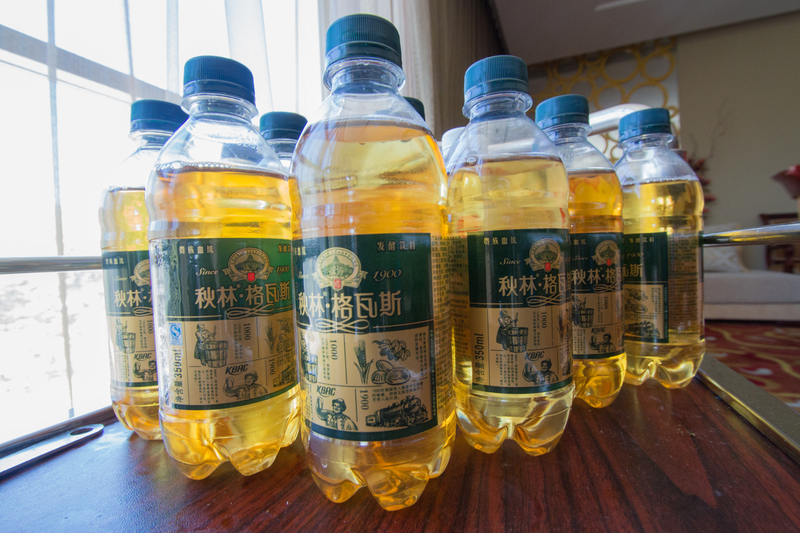 In 2011 it decided to popularize the drink in the rest of China by moving its factory to Tianjin, a more centrally located major city that serves as Beijing’s port. The move allowed Churin to expand sales to 20,000 tons in its first year there, prompting it to set its sights on 100,000 tons within three years. Kvass is a fermented beverage made from black or regular rye bread. The color of the bread used contributes to the colour of the resulting drink. It is classified as a non-alcoholic drink by Russian and Ukrainian standards, as the alcohol content from fermentation is typically less than 1.2%. Generally, the alcohol content is low (0.05% – 1.0%). It is often flavoured with fruits such as strawberries and raisins, or with herbs such as mint. Kvass is also used for preparing a cold summertime soup called okroshka. It is especially popular in Russia and Ukraine, but also well-known throughout Belarus, Estonia, Serbia, Poland, Latvia and Lithuania, as well as in other former Soviet states such as Georgia, Kazakhstan and Armenia where many kvass vendors sell the drink in the streets. Kvass is also popular in Harbin and Xinjiang, China, where Russian culture is a strong influence. The word “Kvass” derived from Old East Slavic квасъ, kvasŭ, meaning “yeast” or “leaven”. Today the words used are almost the same: in Belarusian: квас, kvas; Chinese: 格瓦斯/克瓦斯, géwǎsī/kèwǎsī; Latvian: kvass; Polish kwas chlebowy (bread kvass); Russian: квас, kvas; in Ukrainian: квас/хлібний квас/сирівець, kvas/khlibnyy kvas/syrivets. Except Lithuanian: gira, which means beverage similar to Latvian dzira. In Estonian: kali, which means leaven.